This is my first pot pie. I have never eaten or made one. I know, can you believe that? Isn’t pot pie like an American standard? I think it is, but since it actually contains vegetables (peas, carrots and other veggies) and since I grew up with veggie hating brothers, pot pie was just not an option for me. I am still not really sure I can say I have made a true pot pie since this one does not fit the typical pot pie mold. They are creamy on the inside, right? And have things like peas and mushrooms in them? Oh and a pie crust? Am I right? Well, these pot pies have none of those. Except the creamy party of course! There is no peas, no carrots and no mushrooms. Although, you can definitely add those if you’d like, especially the mushrooms. 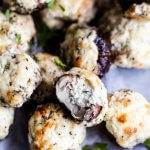 I bet those would be good, but most of the people I regularly feed despise mushrooms. I have learned to love them over the years….once I got over their ugliness, and that they kind of reminded me of moldy things. Actually, they really don’t gross me out at all any more and I kind of think they have a prettiness to them. Especially if I do not let them sit in the fridge for a week and get all slimy. The top is not really a crust, it’s polenta and I kind of think it’s better than a pie crust. 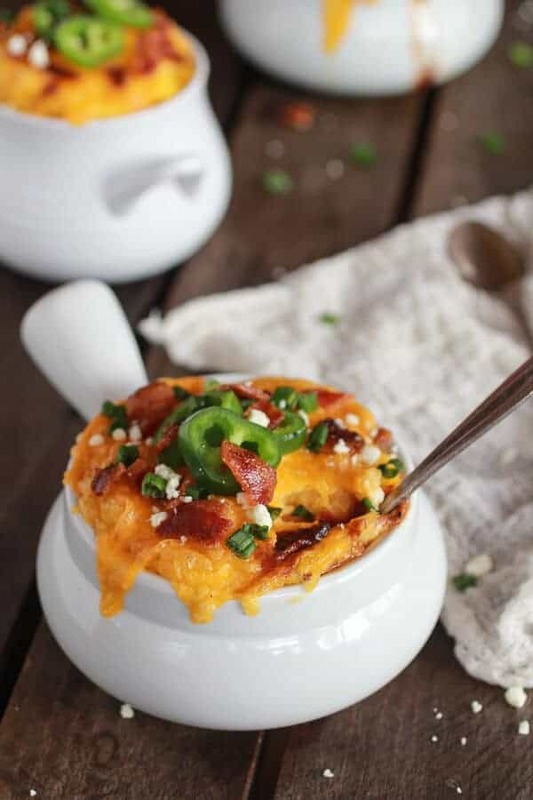 It’s cheesy and creamy and works perfect with a topping of crispy bacon and jalapeños. These are the perfect easy weeknight dinner and they are even packed with veggies, which is just an added bonus. Plus, the veggies cancel out all the cheese, right? Actually (and if you’re a regular reader I’m sure you’ve heard me say this before), in my book cheese is an important part of our diet. It’s good for your teeth and bones and it’s a great source of protein and calcium with plenty of essential nutrients and vitamins, such as zinc and vitamin B, which helps fight disease. It even contains Conjugated Linoleic Acid and Sphingolipids that help to prevent cancer. It certainly has its place in the food pyramid. Hey, everything in moderation. Plus, yesterday we did kale (and more butternut – Oops!)! Wait, and tomorrow is Friday! Heat a 12-inch skillet or high sided pan over medium-high heat and cook bacon until crispy. Remove to a paper towel-lined plate. Remove all but one tablespoon of bacon fat from the pan and then add 1 tablespoon olive oil over medium-high heat.Sprinkle the chicken with salt and pepper. When the oil begins to swirl, add the seasoned chicken and saute until cooked through, about 4 minutes on the first side and 3 minutes on the second side. Remove the chicken to a plate with tongs, leaving the oil in the pan. Rest the chicken for a few minutes, and then chop into 1/2-inch cubes or shred with your hands. To the same pan, add the butternut squash and onions, sprinkle with salt and pepper. Stir and cook until the butternut squash becomes tender, about 10 minutes. Add the red pepper and jalapeños and cook another 5 minutes. Add the garlic, chili powder, paprika, cumin and oregano, cook until fragrant, about 1 minute longer. Sprinkle in the flour and stir until the flour dissolves into the vegetables and juices. Add the chicken broth, tomato paste and hot sauce, raise to a simmer, stirring until thickened. Once the liquid has thickened, stir in the heavy cream and black beans. Season with salt if needed and stir the chicken back into the mixture. Spoon the mixture into 4-6 oven safe baking dishes or one 9 inch pie plate and place on baking sheet with sides. To make the polenta, pour the chicken broth and milk into a medium size saucepan and bring to a boil. Lower the heat to medium and slowly whisk in the polenta. Cook, stirring frequently, until the polenta is soft and beginning to thicken, about 10 to 15 minutes. Stir in 4 ounces cheddar cheese and butter if using, season with salt and pepper. If the polenta seems a little thick you can add a tablespoon of butter or extra milk. Spoon the polenta over the pot pie filling and then top each pie with the remaining cheddar cheese. Place in the oven and bake until the polenta is golden and the cheese is melted, about 20 minutes. 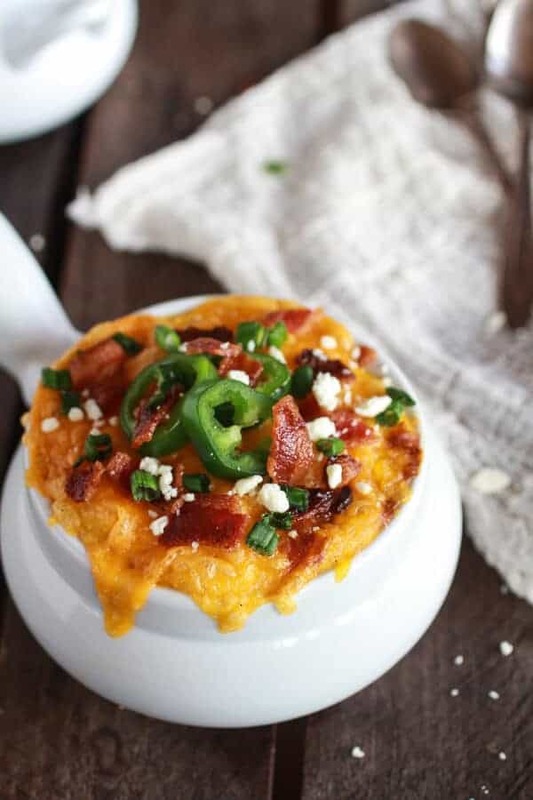 Remove from the oven and top with the reserved crumbled bacon and green onions. EAT! So that tomorrow we can do dessert! 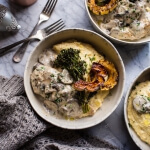 I’m not really a fan of regular pot pies but this looks totally up my street – love all the flavours in this and that awesome polenta topping. Thank so much, Kathryn! 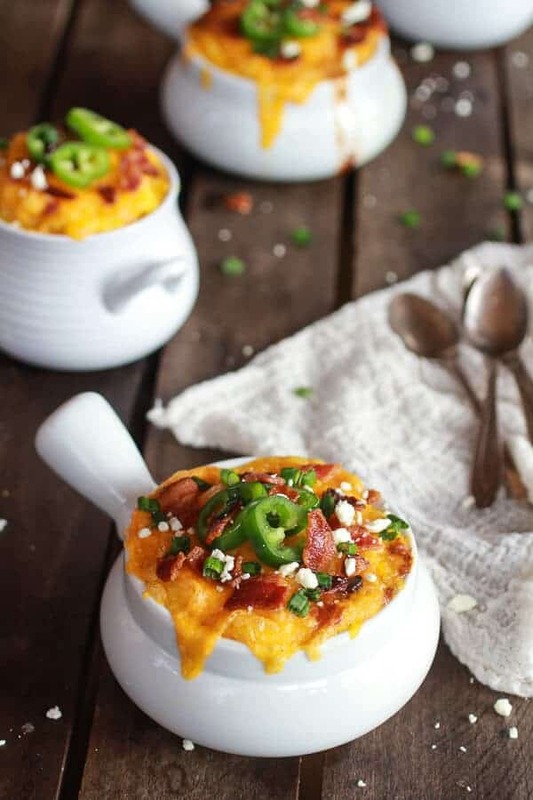 The polenta topping is my favorite! To me, this is the perfect pot pie. 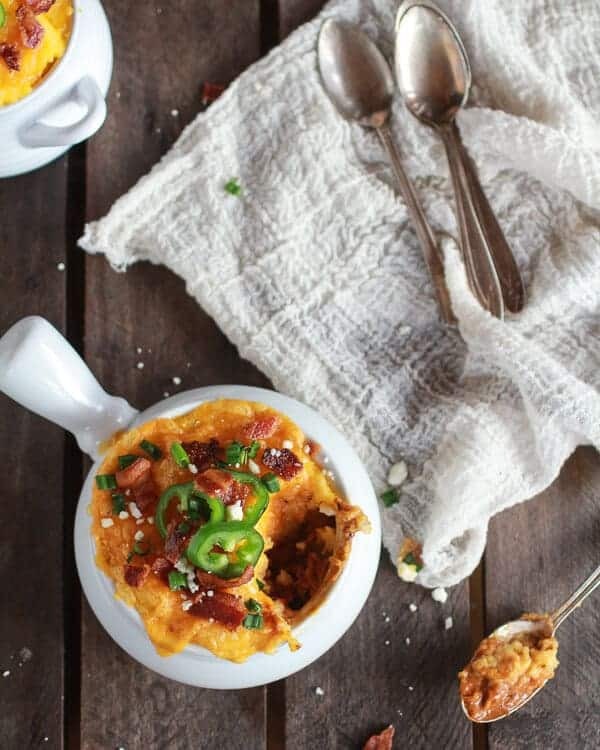 The polenta crust, the butternut squash, the chicken and all of this smoky spices – perfection. Pinned! I have never liked pot pie. The way most people make them in the south is with mixed vegetables and a biscuit/pie crust texture on top. To me if it is a pie with a top crust I want it to be a cobbler. HAHAHA!!! I can’t do the mushrooms at all. This is happening in our kitchen ASAP! Looks absolutely delicious!! Thank you, Marie! Hope you love it! 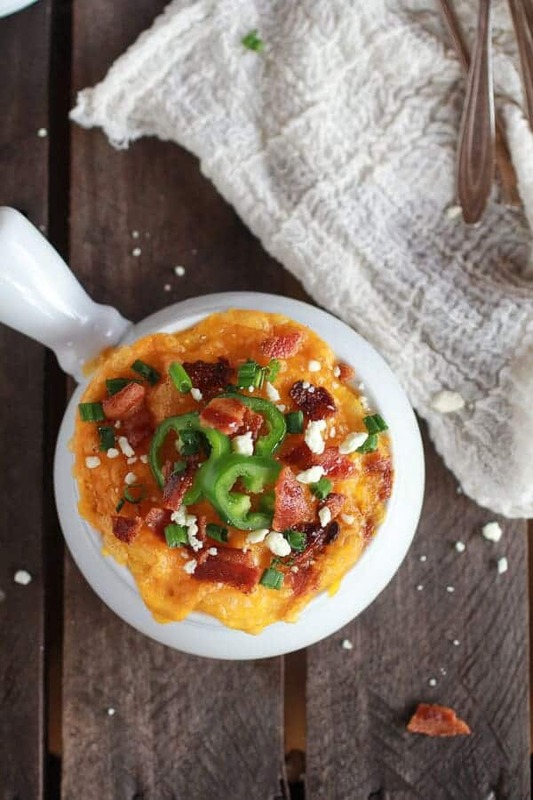 I love your idea of using polenta instead of a pie crust! Ingenious! Cheese is a must. Every day. All day. How can people live without it?! Mind boggling (I totally just typed blogging and had to erase it…. ), I tell you. Two things: One, keep making pot pies because they are one of my favorites and I’d love to see all your creative takes on them. And two, I love those serving dishes – just perfect for pot pie! My gosh, girly, there is nothing I want more right now than one of those polenta pot pies. SO tasty! I need to make these layered goodness asap. The pots are so adorable. 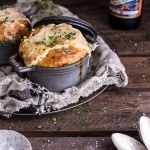 It’s totally cold and rainy and gross here today… I NEED these pot pies in my life!!! 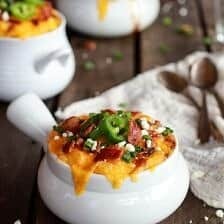 I’m in love with these pot pies! 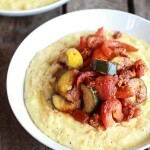 Oh yeah, and I’m obsessed with polenta. 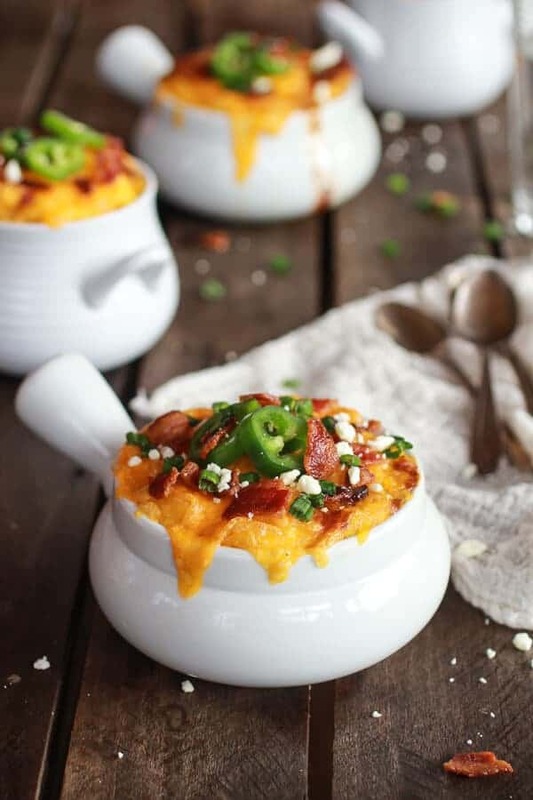 These pot pies look extra delicious, love that jalapeno flavor! Here’s the thing: THESE might be one of the best pot pies i’ve ever seen and my husband makes a mean pot pie so that’s saying Alot. Yum! YA!! Thanks so much Lola! 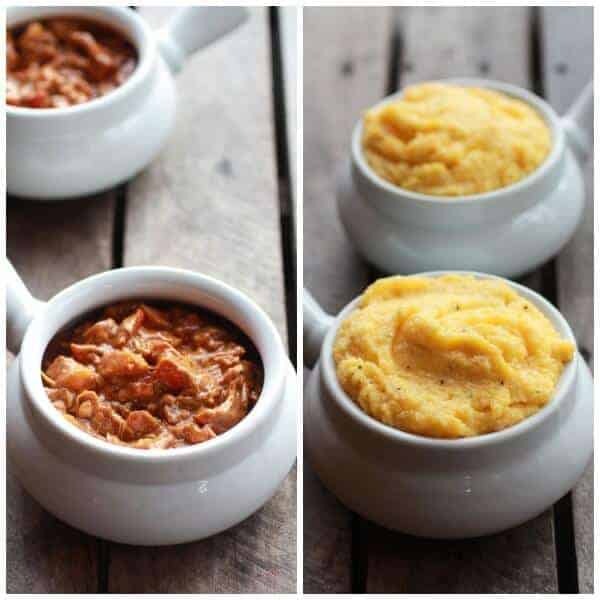 I love that you topped these pot pies with polenta – such a good idea, wish I had one for dinner tonight! I don’t discriminate against pot pie of any kind — the more untraditional the better actually. Loooveee this version. Gonna make this or a variation on it! I am thinking Italian pot pies with hot sausage! MMmmm! Thanks Sophia!! Hope your turns out awesome! I want, I want, I want, I want, I want, I want, I want, I want, I want, I want, I want, I want, I want, I want, I want, I want, I want, I want…right now. I swear, your ideas are so simple, different, mouth-watering…I don’t know how you come up with them! I look at my frig and pantry with all of these ingredients hanging around…could I have put this together with them like you did? Of course not! Thanks so much for doing the creative thinking for my brain! I can make these, freeze them up for later (it’s just me here…), and wha-la! – and they are on the healthy side like so many of your recipes are! Oh my! That looks delicious. You should put that on http://easyfood.tv so people can watch you make it. I bet it smells wonderful. I can’t wait to make it. First this being your first time making pot pies, you knocked it out of the park!! They look and sound amazinggggg!!! 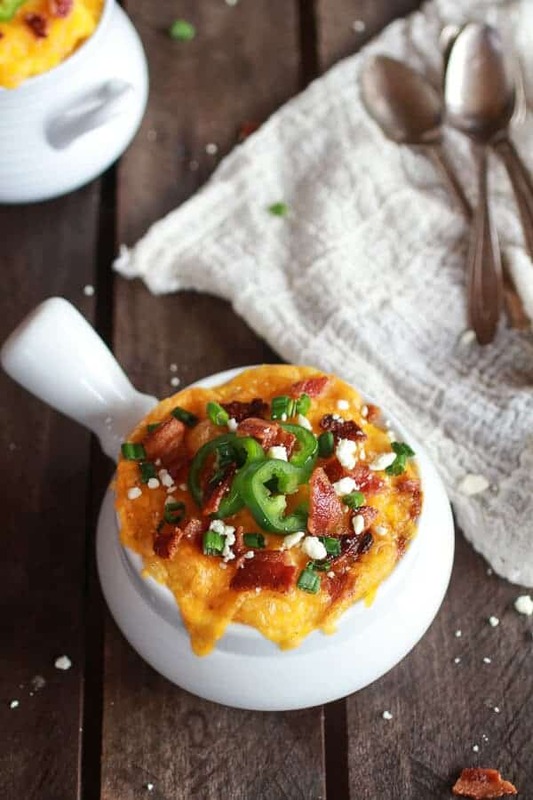 Do you know what the difference is between polenta and grits? One is pretentious and one isn’t. Or as Bobby Flay has said–“you can charge a lot more for polenta on a menu”. I actually think they are pretty much the same thing. 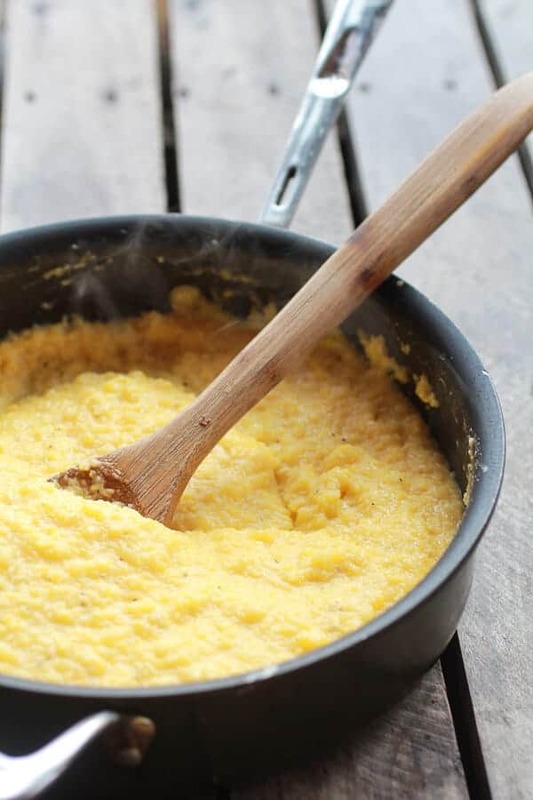 Italians call it polenta, Southerners call them grits. I have read that you can even just buy coarse cornmeal and you are good to go! Hope this helps and thank you!